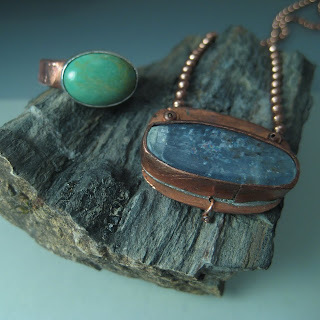 I made my first piece of metalsmithed jewelry in 2006 out of copper and kyanite. Being able to cut, form, solder, and set a stone was an incredibly freeing experience for me. I still did not understand all the possibilities or limitations of the metal, but was anxious to figure them out. I began to read Tim McCreight's "Complete Metalsmith" and try to absorb what I could. I have always wanted to do something that would have the permanence of metal. At the time, I didn't even know how to purchase silver wire or sheet. Silver was going for $8 a troy ounce. So, I got some copper sheet from a local junkyard that was originally intended to be used for flashing around the gutters on roofs. I used a kyanite bead in lieu of a proper cabochon. I learned the old fashioned way with trial and error that kyanite is a soft stone! (Note the damage at one end of the stone.) At the time Gary Pack, a local bench jeweler who "refused to teach," would let me keep him company and would answer my questions as I watched him work. I can't even really remember what I used for solder; I think I may have borrowed some silver solder palates from Gary. I know, the necklace was quite ambitious for a first piece, but I really wanted to set stones and solder from the beginning. I was also surprised to see the bezel on the turquoise ring, because it turned out so nice for my first time setting a stone in silver. I do remember that Gary suggested filing the bezel then sanding it to get it thinner. (He was not impressed with the thick bezel on the kyanite piece). I still like clean designs. I still like working with gemstones, and I still like to mix metals. I still like feeling that there is so much more to learn and get excited knowing that there is a lifetime to perfect this art. For other blogs on first pieces of metalsmithed jewelry from amazing artists follow the links! It's so nice to get to know a little more about each and everyone of you guys reading these entries. It blows me away that you only started 3 years ago! Thanks ladies! I'm thrilled to get a chance to look back and see what I've done in only 3 years. perfect bezel! If you had seen my first piece you would have laughed! this was a fun story, sara!...I imagine you 'peering' over 'Gary, I dont teaches' shoulder! forgotten. . . . .